Note: the cache is not at the posted coordinates but is located at a distance no greater than 250 meters from them. This is what you have to do to get the cache: run around like a chicken without a head. Along a circle. Along a specific circle of radius 250 meters whose centre is at the posted coordinates. During your run, you will bump into six trees, each with a copper tag indicating a letter and a digit. 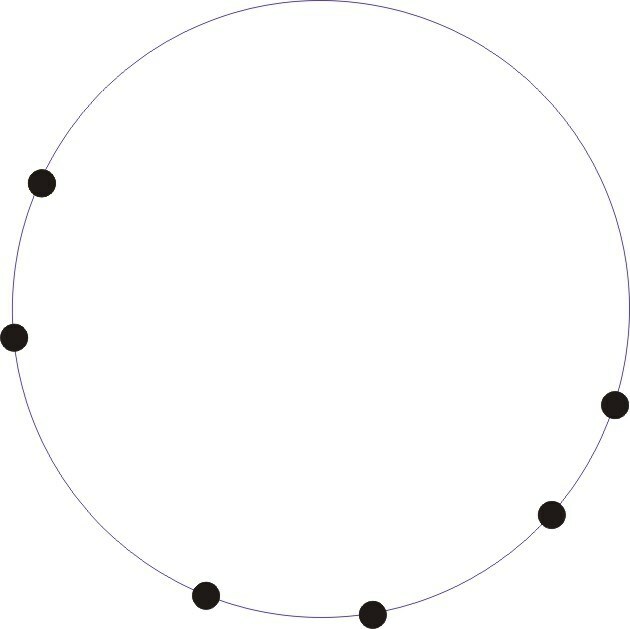 Each tag will be facing the centre of the circle. After having bumped into all six trees, run for the cache at a distance of ABC meters from the centre of the circle with true North bearing DEF degrees. On your mark, get set, chop! If you need a hint, check out the tag position diagram. North is not indicated, and the diagram has been rotated. It is to scale. Only look at this if you need a hint!